It is a strange but none the-less charming fact that an object as beautifully round, smooth and translucent as a full moon exists only because a grain of sand has irritated the insides of an oyster. 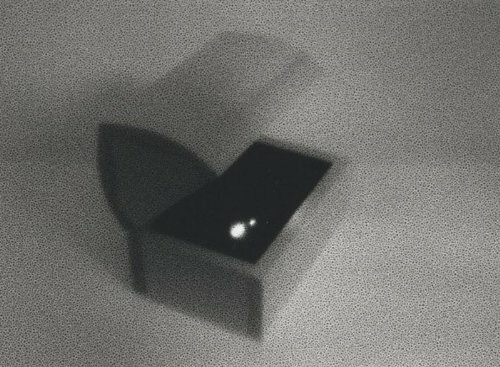 Yuki Onodera, a Japanese photographer now living in France, has taken this quirky process of nature as inspiration for a series of wonderfully atmospheric and aptly grainy black-and-white pictures. A speck of sand has infiltrated the lens of her camera and is now transformed into a pearl that hovers tantalizingly above the heads of people in a crowd, like a luminous being of pure light. How to Make a Pearl is published as part of our One Picture Book Series in an edition limited to 500 numbered and signed copies. Each book comes with an original black-and-white print tipped into the final page. Hardcover, 5-1/2 x 7-1/4, 16 pages, 12 duotone plates, 1 original print.